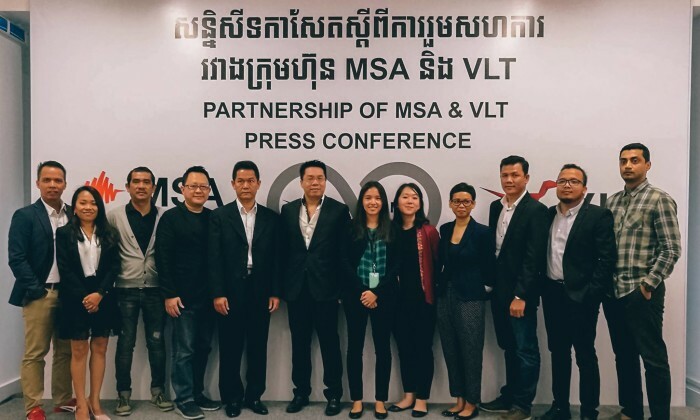 Malaysian digital agency VLT has entered into a joint venture with Cambodia’s leading media agency MSA to offer digital-led experiences and solutions for Cambodia’s rapidly-growing businesses and brands. The partnership will see the two agencies combine its expertise to form an integrated digital, media, social, content and marketing services team. On that, VLT will bring a team of its design, digital strategy and content specialists to Phnom Penh, to serve both MSA’s existing clients and explore new opportunities afforded by its new integrated offering. The partnership serves to strengthened MSA’s fully integrated expertise in advertising and marketing services, in line with its regeneration exercise to mark its 16 years of success in the market, said the agency. It also aims to capture opportunities and growth in Cambodia’s digital advertising, media and services market, while bringing the much-needed innovation and digital experiences to Cambodians as a whole. MSA, which has over 250 employees, said it has a long-standing relationship with many established brands such as Yeo’s, AIA, EVA Air, Smart, Rohto-Mentholatum, Wrigley’s, Sanofi and Revlon. Hence, the new partnership with VLT is expected to deliver further growth and confidence in the client-agency relationships. “I’d like to say, what no one has dared to say. Digital is mainstream. Digital is at the core of every advertising, every communication we do for our clients,” Phirun Kao, CEO of MSA said, adding the locals nowadays consume content seamlessly across all mediums, and “that should also be how we think”. “This partnership targets the progressive growth in Cambodia’s digital advertising, also the effectiveness of reaching out to the population on behalf of businesses and brands,” he added. Meanwhile, VLT, which has offices around Kuala Lumpur and Singapore, has made a name in the local scene in the past four years with clients including Astro, BMW, DBS, Munchy’s and Sime Darby. Adrian Lim, chief executive officer (CEO) of VLT said with the new tie-up, it will be “starting up with a series of digital discovery days in July”. “We are thrilled to have our first presence in Indochina created with MSA in Phnom Penh. Cambodia is a young growth market in the center of an ecosystem hungry for digital content and services, and we are proud to be able to share our experience growing some of the world’s best brands with our new partners there,” Lim said. In 2016, Kantar TNS identified Cambodia as highest-ranked for receptiveness to social media advertising, branded content, and interactions via Facebook. "While prediction might be paired with creepy, anticipation on the other hand, is seen as empowering.".. Mangham Gaxiola has launched its digital and direct marketing unit in partnership with former Ogilvy staffer Andrea Conyard. ..